Texas Tailgate® Launches Photo Contest Offering a FREE* Can of Chili Sauce and a $250 Grand Prize. Sanford, North Carolina: Boone Brands, manufacturer of Texas Tailgate® Chili Sauce launched the “How Do You Dress Your Dogs?” photo contest on their social media sites on Thursday, August 24, 2017. 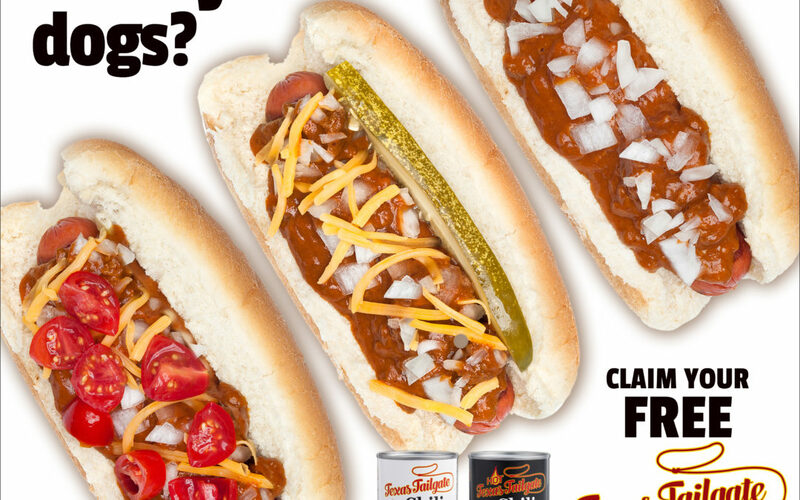 Texas Tailgate® Chili Sauce is used as a topping for hot dogs and hamburgers, to create familiar and flavorful Coney Island Hot Dogs, Carolina Chili Slaw Dogs, Chili Cheese Burgers and Sloppy Joes. 3. Register at http://boonebrands.com/how-do-you-dress-your-dogs/ and submit pictures of “How You Dress Your Dogs” with Texas Tailgate® Chili Sauce before October 8, 2017. Entries may be submitted starting on August 24, 2017 through October 8, 2017 11:59pm Eastern Standard Time. The $250 Grand Prize award winner will be selected by an independent judging organization from all eligible photo entries on October 15, 2017. Winner will be contacted by phone or email by October 20, 2017. There is no limit to the number of photos you may submit to be entered in the Grand Prize contest. Visit http://boonebrands.com/how-do-you-dress-your-dogs for more information and official contest rules. Boone Brands is looking forward to working with a local non -profit or charitable organization to share Mrs. Fearnow’s Brunswick Stew with All Natural Chicken at the 2017 Dinwiddie County Fair! https://www.facebook.com/events/218010568644305/?active_tab=discussion. Submit your applications now. Boone Brands and our families had a fun weekend sampling the delicious goodness of Mrs. Fearnow’s All Natural Chicken Brunswick Stew at The Got To Be NC Festival. We are honored to continue the Hope Farm tradition according to Lillie Pearl Fearnow’s recipe. It was exciting to introduce Brunswick Stew to the North Carolina community and connect with our loyal customers.